JTWC: Forecast location of Super Typhoon Yolanda (Haiyan) packing winds of 333.36 kilometers per hour at 8 a.m. tomorrow, November 8. TYPHOON “YOLANDA” CONTINUES TO MOVE CLOSER AND POSES THREAT TO EASTERN VISAYAS. Location of eye/center: At 1:00 AM today, the eye of Typhoon “YOLANDA” was located based on all available data including Guiuan Radar at 170 km Southeast of Guiuan, Eastern Samar (10.5°N, 127.2°E). Strength: Maximum sustained winds of 225 kph near the center and gustiness of up to 260 kph. Movement: Forecast to move West Northwest at 39 kph. Forecast Position: Typhoon “YOLANDA” is expected to make landfall this morning (5 am) over Guiuan, Eastern Samar. It will be at 170 km West Northwest of Coron, Palawan by tomorrow evening. By Saturday morning, it will be at 665 km West Northwest of Coron, Palawan or outside the Philippine Area of Responsibility. VISAYAS: Northern Samar, Eastern Samar, Samar, Leyte, Southern Leyte Biliran Province, Northern Cebu including Cebu City, Bantayan and Camotes Islands, Northern Negros Occidental, Capiz, Aklan, Antique, Iloilo and Guimaras. 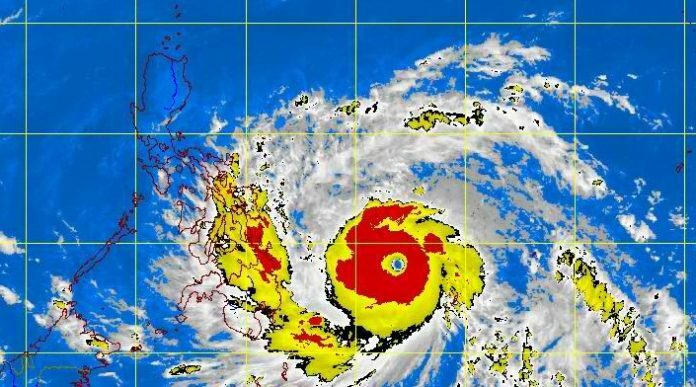 •Yolanda, after hitting Guiuan ( Eastern Samar), is expected to traverse the provinces of Biliran, the Northern tip of Cebu, Iloilo, Capiz, Aklan, Romblon, Semirara Island, the Southern part of Mindoro then Busuanga and will exit the Philippine landmass (on Saturday early morning) towards the West Philippine Sea. •Estimated rainfall amount is from 10.0 – 30.0 mm per hour (Heavy – Intense) within the 600 km diameter of the Typhoon. •Sea travel is risky over the seaboards of Northern Luzon and over the eastern seaboard of Central Luzon. •Residents in low lying and mountainous areas under signal #4, #3,#2 & #1 are alerted against possible flashfloods and landslides. Likewise, those living in coastal areas under signal #4, #3 and #2 are alerted against storm surges which may reach up to 7-meter wave height. •The public and the disaster risk reduction and management council concerned are advised to take appropriate actions and watch for the next bulletin to be issued at 5 AM today. Super Typhoon HAIYAN (YOLANDA) has turned into a 305 km/hr howler…and is considered as the most powerful tropical cyclone ever to develop since Super Typhoon Tip of October 1979…moving closer to Eastern Visayas…likely to make landfall over Eastern Leyte or Southern Samar after sunrise today. Important Note: This typhoon is similar in track but more powerful in strength of Super Typhoon MIKE (RUPING) which passed across the Visayas on November 12, 1990 which devastated much of Central Visayas paricularly Cebu. Residents living along the eastern seaboards of the Philippines from Bicol Region…down to Northeastern Mindanao should continue monitoring the approach of this destructive typhoon for possible unprecendented track changes. Plans for emergency situations and/or disaster management planning must be completed as soon as possible as the dangerous cyclone is only 6 hours away from hitting land. Do not use this for life or death decisions. This update is intended for additional information purposes only. Kindly refer to your national weather agency for official warnings, advisories or bulletins. As of 11:00 pm today, the eye of STY Haiyan (Yolanda) was located over the South Philippine Sea…about 320 km east-southeast of Tacloban City, Leyte or 425 km east of Metro Cebu…currently moving very quickly west-northwest with a forward speed of 39 km/hr towards Leyte and Southern Samar Area. Maximum Sustained Winds (1-min. avg) have increased to 305 km/hr near the center with higher gusts. Typhoon Force Winds (118 km/hr or more) extend outward up to 95 kilometers from the center…and Tropical Storm Force Winds (63-117 km/hr) extend outward up to 240 kilometers from the center. STY Haiyan is a small-sized tropical cyclone with a diameter of 610 kilometers across. STY Haiyan is expected to move fast in a generally straight, west-northwest track throughout the forecast period. On the forecast track, the core of STY Haiyan will make landfall over the central-eastern shores of Leyte, about 45 km south of Tacloban City between 8-9 AM Friday and cross Northern Leyte passing over or very close to Ormoc City just around noontime Friday. This Super Typhoon will be passing over the northern tip of Cebu, very close to Bogo City around 2 PM then it will start traversing the North Central part of the Visayas through Friday evening…across Northern Panay (very close to Roxas City and Boracay) late Friday afternoon…and will be in the vicinity of Coron, Palawan by Friday midnight. 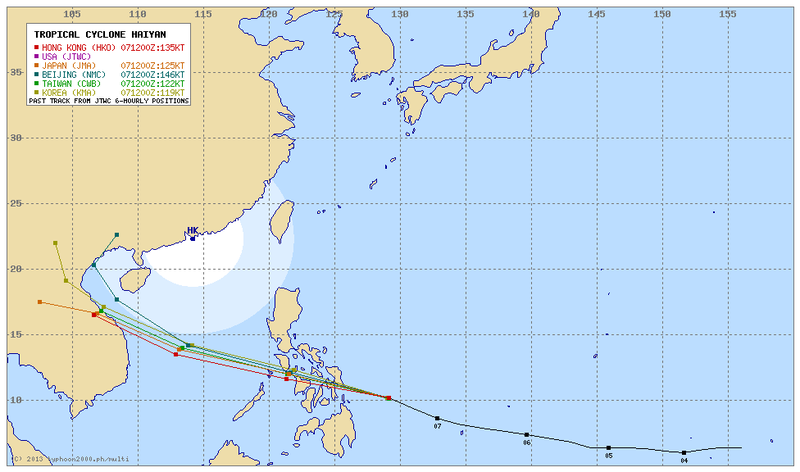 On Saturday evening, Haiyan (Yolanda) will exit the Philippine Area of Responsibility (PAR). STY Haiyan (Yolanda) will start to weaken slightly within the next 24 through 48 hours as the system makes landfall over North Central Visayas…and will be just a Category 4 TY on Saturday. Advance Intensity Forecast (AIF) shows its 1-minute maximum sustained winds decreasing to just 215 km/hr by Saturday evening. FRIDAY EVENING: Weakens slightly but remains a very dangerous Category 4 Super Typhoon…over Sulu Sea as it approaches Calamian Group…about 75 km WSW of Boracay [8PM NOV 08: 11.6N 121.3E @ 240kph]. SATURDAY EVENING: Moves out of the Philippine Area of Responsibility (PAR)…weakens further while over the South China and West Philippine Seas…about 595 km SE of Da Nang, Vietnam [8PM NOV 09: 13.9N 113.3E @ 215kph]. SUNDAY EVENING: Making landfall along the coast of Central Vietnam…weakens to Category 2…about 70 km NE of Hue, Vietnam [8PM NOV 10: 17.0N 107.2E @ 165kph]. *Please be reminded that the Forecast Outlook changes every 6 hours, and the Day 2 and 3 Forecast Track has an average error of 100 and 250 km respectively…while the wind speed forecast error, averages 35 kph per day. Therefore, a turn to the left or right of its future track and changes in its wind speed must be anticipated from time to time. Below is the summary of the storm’s parts and its hazards affecting specific areas. You can also view this image link for you to understand the parts. 30-KM ROUND EYE – over water. Possible calm and lull conditions (with <20 kph winds) will be expected inside the eye (click here to know more about the EYE). EYEWALL – where Typhoon Conditions with Typhoon Force Winds (>118 kph) will be expected within this wall. 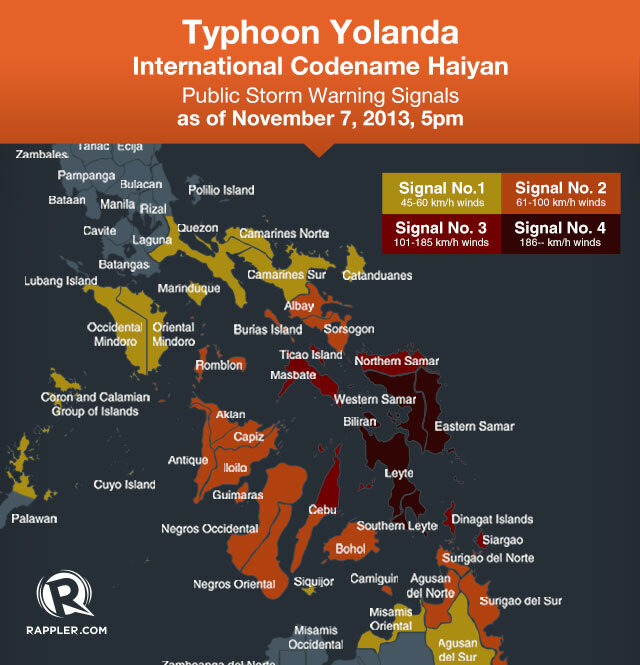 Affected Areas: None yet…but approaching the shores of Southern Samar and Leyte. (click here to know more about the Eyewall). INNER RAINBANDS – where Tropical Storm Conditions with Tropical Storm Force Winds (63-100 kph) will be expected. Affected Areas: Samar, Leyte, Masbate, and Caraga. OUTER RAINBANDS – where Tropical Depression Conditions with light, moderate to strong winds (30-62 kph) will be expected. Affected Areas: Bicol Region, Northern Palawan, Mindoro, Metro Manila, CaLaBaRZon, Rest of Visayas and Mindanao (click here to know more about Rainbands). 24HR TOTAL RAINFALL ACCUMULATION – from 5 up to 100 mm (slight to heavy rainfall) can be expected along areas affected by the outer & inner rainbands (see above)…with isolated amounts of 101 to 250 mm (heavy) along areas near the center of Haiyan. 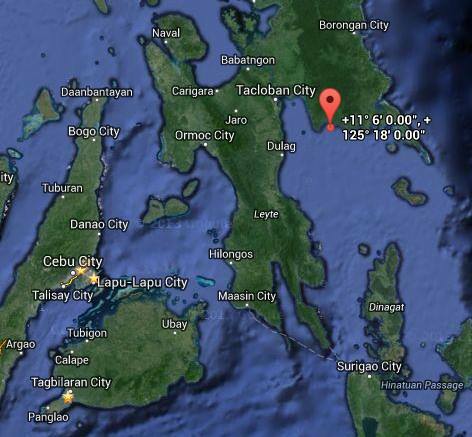 How much damages did our province get from this devastating typhoon? There is still no contact in certain municipalities of the province. I hope the authorities are doing everything they can to restore the communication lines so as for us, native Biliranons who are far from our homeland, to know and not be blinded on what’s going on there. We just hope for zero casualty. And I hope that the communication lines will be restored as soon as possible. I am just a concerned loved one and citizen of Billiran. Bangon Biliran!